In this article you will find guidance on how practicing magicians can harness the forces of aggression to foster the ongoing process of spirit contact and spiritual integration. To start with it's good to remind us of a basic insight which is essential to working ritual or visionary magic on an advanced level. The abilities to listen, to be humble and to continuously question our own insights form critical skills for the advanced magical practitioner. Born out of the necessity to keep one's level of integrity aligned to the level of magical practice, is the requirement for magicians to grow on both sides of the circle over a lifetime - inside of it when engaging with spirits as well as outside of it when engaging with fellow humans. While the physical, astral and mental planes might be discrete, each spirit working with us will see the nature of our intent and the level of our integrity long before our ritual fires or clouds of incense... Therefore if we aim to continuously ascend on The Ladder of Lights, we also need to continue the process of progressive individuation: Our integrity, i.e. the consistency between our values and our behaviours needs to continuously mature with each decade we take. This necessity isn't born from ethical considerations. Quite the opposite: evolving one’s ethics and strengthening the bond between one’s values and behaviours is an essential - and highly effective - tool to shield us from physical as well as psychological harm on our magical journey. Backlashes that might be easily absorbed by our body and psyche when dealing with astral larvae or our own Elementals will just wipe our physical and psychological boundaries away once we have transgressed into the deeper territories of magic. The Lamen magicians wear over their chest simply is an outer representation of the one they wear inside their hearts. While the outer lamen on one side displays the signs and sigils of the spirit to be worked with and the characters and names of one’s personal daimon on the other, so must we be prepared for the forces of the external spirit to flow into our own - and to enrich, to build upon what is present within us already - rather than destroying psychological or physical structures that initially might seem foreign to it. Destruction and reconstruction of boundaries, integration and assimilation of new forces into ourselves and our lives therefore is the essential art we must master as magicians. It is not what will teach us how to ascend on the ladder of lights, but it is what will keep us firmly grounded to earth elsewise. Wether it will keep us from taking the first step or wether it will throw us down to the ground once we fail to balance - it is our handling of the forces of aggression which determine how far we will climb, one rung at a time. Clearly this is the way most of us understand this concept these days. However, when we take a closer look at the etymological roots of the word we discover more of its original idea. The two roots it is made up of are ‘ad’ (latin: to) and ‘greddi’ (from latin gradus: a step). In its genuine meaning aggression therefore meant a determined way of approaching, a forceful movement towards something. The notion of harmfulness or hostility isn’t necessarily central to the original concept. The actual focus of the term is on how something is being approached in a forceful manner, not on the subsequent effect this might have on the body or being itself. Similar to The Spirit Contact Cycle I suggest we explore this alternative concept of aggression deeper by stealing insights from the field of Gestalt Psychology and then re-applying these to our magical practice. Rather than creating a psychological interpretation of magic - something I am not advocating at all - this approach will allow us to better understand the nature of the aggressive force we host within ourselves. Wether we then leverage it to engage with fellow humans or spiritual beings should make little difference to the actual concept. The Aggression Cycle is directly developed from the innovative interpretation of aggression’s role in human behaviour according to Gestalt Psychology. For the interested reader I recommend the seminal book 'Gestalt Therapy' from 1951 by Fritz Perls, Ralph Hefferlein and Paul Goodman. Personally I believe there will be more value for many practicing magicians to work through this tome than through many old grimoires: The book will cost significantly less to acquire, the reading experience will certainly be equally difficult and the abyss between intellectual understanding and actual application is promising to be just as challenging - and rewarding if achieved through practice in the end. The function and stages of the Aggression Cycle are best illustrated by the process of eating and digesting. A process that is critical to psychological research on children’s behaviour and understanding their developing subject-environment relationship - as well as to actual magical practice as recorded since ancient times. In the following paragraphs we will explore each step of the cycle in detail. Once we have established a thorough understanding of its elemental stages, we can proceed to apply them to our own magical practice in the following chapter. Sensation: The process of eating begins with the first sensation of appetite or hunger. Specifically, what happens in this initial stage is that one’s sensation of an emerging need comes into the foreground. In the case of eating the craving for food could be full of relish or angry depending on its intensity. In either case it triggers an impulse of changing our current state. In other words a new perception has emerged from our field of sensation and triggered an impulse for change. Impulse: The less sensitive to one’s own needs the person in question will be the more this sequence will blur with the previous one. People whoonly realize that they have been disgruntled for several hours because they were hungry, have grown numb to the more subtle sensations of their body. The unfortunate situation is that in these cases the sensation can often be realized subconsciously and acted out in a wrong direction before realizing its actual aim. In the given example one would be grumpy or shout at people before realizing that the place this ‘aggression’ belonged to was indeed the kitchen - where the actual satisfaction to the need can be found: food. Initiative: The third stage is essential to the process and we call it the initiative to act. It is the build up process of energy which is needed to progress to action in the next stage. Here the charge is gathered and the quality and direction of the act that follow are determined. This stage is important to differentiate from the others as it can easily cripple the process and stop us from reaching satisfaction. As Perls, Hefferlein and Goodman said it so brilliantly: “Fear results in giving up the appetite.” (p.397) Most often what prevents us to move from impulse through to aggressive action are feelings of our inability to succeed, frustration with ourselves or obstacles in our way and a perception of impotence with regards to creating satisfaction for the need in question. However, in case we feel sufficiently committed and competent to move forward our aggressive action can take two different directions. 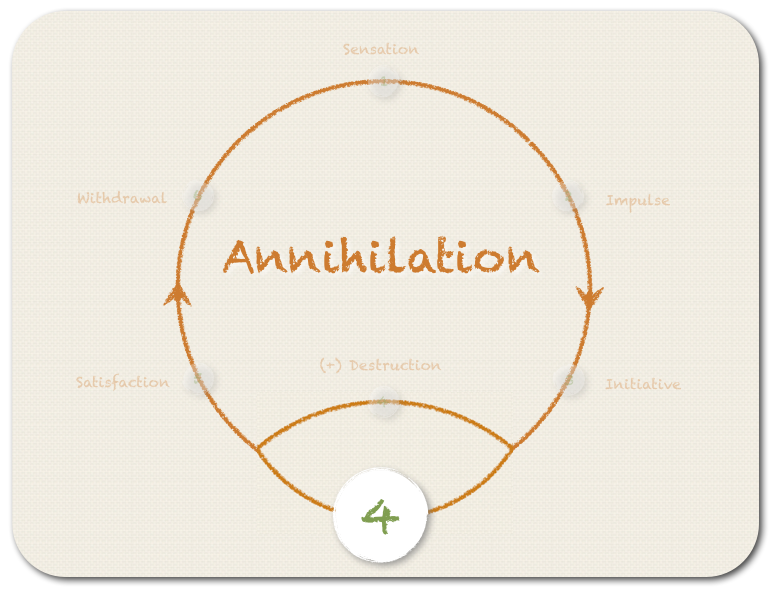 Annihilation: According to Gestalt Psychology annihilation is the alternative aggressive behavior we can show to act upon an aggressive impulse perceived. In opposition to destruction, however, annihilation is directed towards expelling an object taken in already. Here the need is realized as the pain or nausea of something within ourselves, our field of awareness that needs to be removed. Annihilation therefore describes the opposite process to digesting - the rejection and expelling of a seemingly foreign and indigestible object from inside of ourselves. Hhere aggression takes the form of anger. Satisfaction: The new whole is starting to take its form and closing its boundaries again. Either something indigestible has been expelled (Annihilation) or new nutrition has been taken in (Destruction). In both cases the change has taken effect upon both objects involved. In this stage movement slows down, the initial sensation ebbs away and satisfaction of the impulse is achieved. This is the moment when we lean back from a nutritious meal, still sensing the flavour of the spices in our mouth, feeling the pleasurable digestion in our body and the appetite receding. Equally it is the phase after we spewed out the object that caused our nausea, leaning back in relief as the pain in our stomach subsides. Either way, the aggressive impulse and initiative have reached their goal. Withdrawal: During the last phase of the Aggressive Cycle we end our conscious involvement with the process we went through. While echoes of the experience might still resound through our subconsciousness we withdraw from the former situation consciously. We return to a new state of presence and awareness; normally for a short period only we return to a state of balance and non-contact. We are neither engaged in the previous sensation nor yet involved in a new one; we are in-between experiences. No new gestalt has emerged into the foreground yet; all possibilities are quietly waiting in the background. 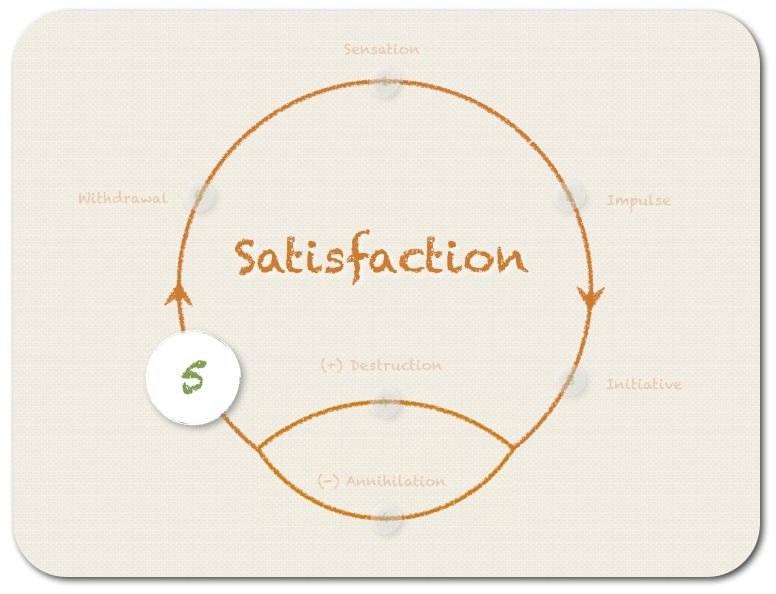 As we can see, what the Aggressive Cycle describes is the critical role aggression plays in not only satisfying our needs, but essentially in assimilating any new experience to ourselves. Without aggression no true integration is possible. Without aggression neither growth is possible, nor true contact which affects change in both parties involved. Aggression - once acted out in a genuine way and not misdirected towards substitute objects due to frustration of original needs - is the force that allows ourselves to redefine our own boundaries. It allows us to consciously decide wether to destruct and integrate or wether to annihilate and expel any substance, being or encounter we experience in our lives. Aggression therefore is the fundamental force of both, deeply enriching encounters and maintaing our own autonomy. Now, how does the above relate to our magical practices? The answer is relatively straightforward - once we manage to understand every encounter as a slightly adjusted version of the basic example of eating. 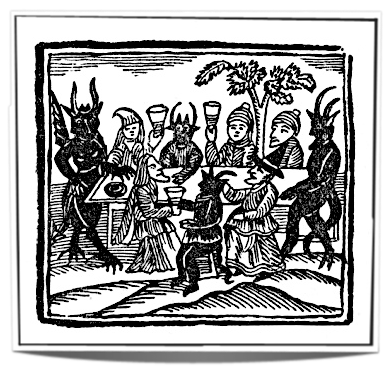 Witches preparing a herbal medicine with the help of a demon (14th century) - an example of creating 'food' that is charged by both spirits and humans. Whenever we encounter a new ‘gestalt‘ - a demon, a chthonic or celestial being, literally any consciousness we interact with in our magical practice - this encounter itself affects change on both of us, ourselves and the being we interact with. We might not devour the entire being - or be devoured by it - yet the principle remains true. Wether we eat our enemies like ancient tribes did - in order to first destroy their powers and then to integrate them into ourselves - or wether we assimilate the energies, the touch, the presence and impact of a being we interact with, is simply a question of scale. The underlying sequence of events remains the same. Everything we interact with eats from us and vice versa. We are involved in a constant process of opening and reestablishing our boundaries, of destruction, assimilation and integration. Think of all the sacred things we are not meant to touch - the holy of holy in a temple, breeding animals, quicksilver, plutonium... Because of the risk of either poisoning them or us, we simply aren't meant to change their state of being. They need to maintain their presence untouched, unassimilated to other beings, as pure as they are. Now think of all the demons we coerce into our ‘circles of the Arte’. Think of the realms they stem from, how distant and foreign they might be to the human realm. Our touch on them, our words in their presence might trigger significant aggression on their end - making them crouch in pain and nausea, trying to spew us out like a foul fruit put in their mouth by accident. 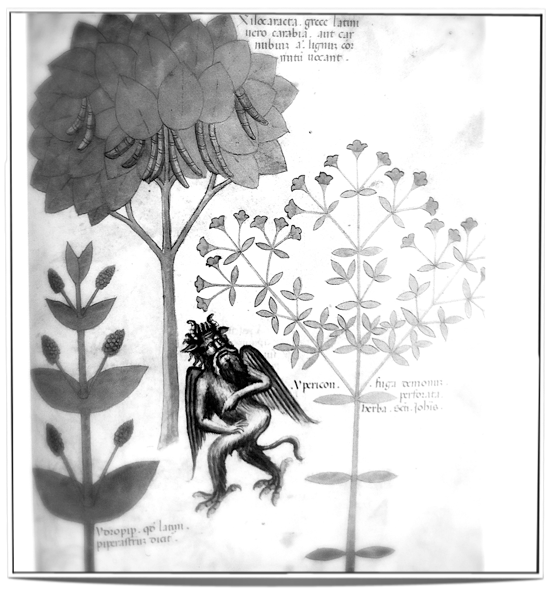 The herb Ypericon repelling a demon (15th century) - an example of annihilation by use of herbs. As magicians we use aggression all the time. We use it to create contact that otherwise wouldn’t come forth - we draw down the moon, we summon up the chthonic spirits. With every rite we transgress boundaries and immerse ourselves into realms and consciousnesses that normally are veiled for humans. This is what I meant by stealing the learnings from Gestalt Psychology and applying them to our magical practice: We do not do this to swap paradigms and to look at spiritual beings through the lens of psychology. We do it to get a sharper look on ourselves and to the way we interact with our environment as humans. Only then can we become more careful and conscious in how we bond with the spirits around us. We learned that aggression in the form of destruction or annihilation is essential to personal growth and integrating new experiences into ourselves. Thus it becomes our responsibility to chose wisely when to reach out for beings and boundaries that normally remain out of our human reach. We might easily strive to eat from plates reserved for other kinds of beings, containing poisonous fruits for humans. Our bodies and minds might die in pain while trying to digest them, to dissect and expel these foreign fruits - or we might be able to integrate them and show shades of growth and virtues that would not have flourished within us otherwise. It is the strength of our container, the vessel we are, coupled with the wisdom we apply in choosing our contacts that determines the outcome of our journeys. As a final chapter, let me share a few practical applications of the Aggression Cycle in magic. What you will find is a set of questions I saw myself confronted with when first understanding the true implications of aggression in magic... Since then they have grown into tools I often leverage when preparing new ritual operations for the first time. When creating your next talisman think through the steps of the Aggression Cycle. What is the sensation and impulse that triggered your actions? Will this be a process of Annihilation or Destruction? Are you trying to to attract, digest and integrate new forces, substances or experiences into yourself? Or are you trying to dissect, annihilate and expel indigestible substances from your own being? In case of Destruction: Once you succeeded in attracting the forces in question, how can you ensure your body and mind are strong enough to digest them? What can you do to either strengthen your digestive functions or to reduce the effectiveness of the substances to be introjected? In case of Annihilation: If the substance, experience or being you need to spew out from yourself is inside of you / your life at the moment, how did it get there? At which point did you make contact with it and allowed it to insert itself into you? What do you need to do to ensure after spewing it out your boundaries will remain closed to its effects? For any experienced practitioner in Sigil Magic - I guess these questions make it quite obvious how this process is actively leveraged to create tangible results in this form of magic. While the process of injecting sigils into oneself is very straight forward, just think about the reverse process. I.e. the difficulties you might face when trying to annihilate forces previously injected in case the results weren’t what you hoped for? There is no good or bad, no wrong or right here. There are simply consequences of our actions - the impact of the food we decided to bring into our body. An extreme - and potentially stupid - example of aggressive dissolution of boundaries while in spirit contact - offering oneself up as the physical spirit vessel by use of sexual symbolism. 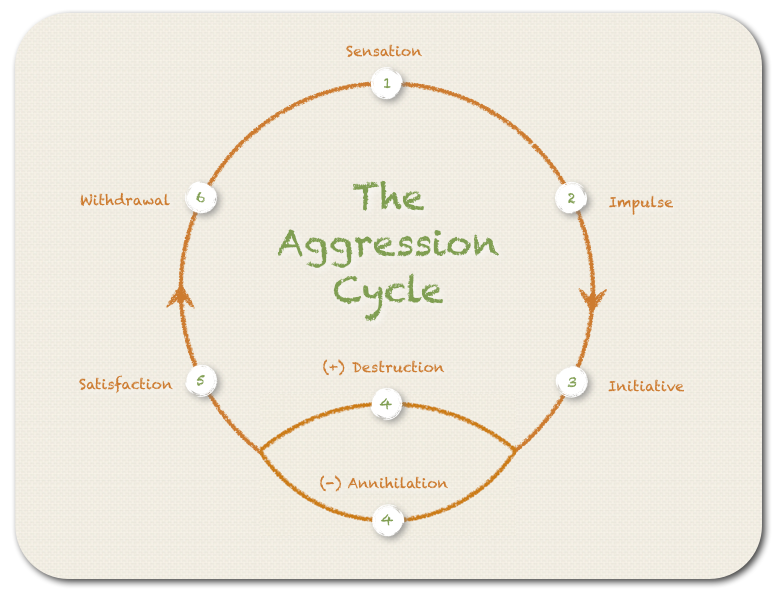 When preparing your next rite think through the steps of the Aggression Cycle. What is the specific ‘food’ you want to ask for from the being you will interact with? Which need or craving is driving you to ask for this, do you understand the true nature of your impulse? Take a closer look at Christian liturgy - the use of bread and wine consecrated by the divine being in question and then shared in a mutual meal. Here you have a straight forward application of the Aggression Cycle in magical rituals. Is there a way you can leverage the approach of a ‘spirit supper’ in your own practice? If you work as priest or priestess preparing a shrine, reflect on the ancient practice to equip it with representations and analogue substances of the being you are about to work with. Mediate on the shrine and everything inside of it as something that will be ‘eaten’ by the spirit once it has taken its dwelling in it. Does it make sense now why you want the entire space to be ‘digestible’ to the consciousness you are calling? As you are effectively forcing contact upon the spirit, the only alternative for it would be to annihilate everything related to the contact. If you work according to the style of the old Grimoires, think about the triangle of Arte, the magic mirror or any paraphernalia you allow the spirit you work with to touch. How will these be changed by the touch and presence of the spirit? Are you prepared for them to become part of the spirit and the spirit part of them? Meditate on the magical circle as a protective boundary in light of the Aggression Cycle. Meditate on the lamen as mentioned above - as a representation of the joint stomach you and the spirit will share. Digesting both your influences as well as the one’s of the spirit into a new ‘gestalt’. Finally, If you plan to do an invocation of a spiritual being into yourself, consider the steps of the Aggression Cycle carefully. Who is eating whom? How are you prepared to guard boundaries in your life, your body, your mind that should not be altered by the spirit? Take a close look at the process of banishing after an invocation rite - do you see the parallels to the process of Annihilation?